The photo as initially found on the internet. It was taken in 1965, probably in April, by a veteran from the Isachsen weather station, Jay Gatlin. Click on the photo for a larger image. In a news release dated 16 March 2005, the Canadian Forces announced they would be carrying out a sovereignty patrol in April 2005, operating out of a now abandoned weather station at Isachsen on Ellef Ringnes Island, in the extreme northern parts of the country. Isachsen was one of the so-called Joint Arctic Weather Stations (JAWS), a network of remote arctic weather stations, built shortly after World War II, and jointly operated by Canada and the United States. Isachsen reportedly has the worst weather in Canada. The interesting part of this news release was that this patrol was to include an emergency response exercise simulating an air crash, and that this simulation was to focus on the wreck of a USAF C-47 that had crashed at Isachsen during the 1950's. Apparently the wreck of that C-47 was still there in 2005, fifty years later. So... Which C-47 was this? And how did it end up there? I learned nothing useful from a quick search in the books and only very little from Google and other internet search engines. All I found was an old photo of the wreck, partly buried in snow, and showing no useful details. This highly detailed photograph was taken by Merlin Mac Aulay, during the summer of 1958. The total lack of snow makes for a huge difference with Jay's photo. It has much less of an arctic taste to it, but because of that it reveals a lot more interesting details. Click on the photo for a larger image. The photo was posted on the website of JAWS veterans, who had all served at one of the Joint Arctic Weather Stations. The assistant manager of the site, Don Shanks, was very willing to help. Through him I came into contact with the photographer, Jay Gatlin, who very kindly rescanned his old polaroid photo in a much higher resolution. This clearly showed the tail number "316062". I also received a photo from another member, Merlin Mac Aulay. This was a highly detailed black & white negative, showing many details. Of course this too showed the same tail number. So, thanks to these veterans, the most important part of the mystery had been solved very quickly. 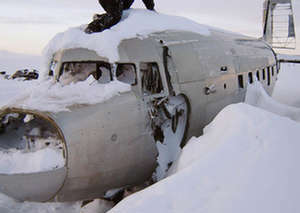 The aircraft that still lies at Isachsen today has been identified as C-47A 43-16062 msn 20528. But how and when did it meet its doom? The researchers at the Air Force Historical Studies Office (AFHSO) normally do not have the staff to deal with these kinds of inquiries, but they nevertheless told me what their records showed. Unfortunately they were unable to offer any other information than a salvage date of 14 October 1949, which was also mentioned in the Air-Britain DC-3 monograph. This didn't help much. Close-up shot taken by Merlin Mac Aulay, showing even more detail. Click on the photo for a larger image. Then I received a news article of some sorts from yet another helpful weather station veteran. It was issued by the Canadian military, and gave a fairly detailed and interesting account of the crash, describing the crash itself and the circumstances that led to it. Although it later turned out to be not entirely accurate (as is common with such articles), it does make for some interesting reading, and gives a good impression of what actually happened. Most importantly, it gave the exact crash date: 9 October 1949. You can read the article here. This date finally enabled me to obtain an extract of the official crash report, scanned from the USAF's microfilm reels. The full report consists of no less than 45 pages, including many photos taken by the captain shortly after the accident, routing slips, memos, recommendations etc. Initially I obtained an extract of the report through Mike Stowe of Accident-Report.Com, which contained the seven most important pages. I later purchased the full report, of which most pages are listed below. The omitted pages 3, 8 and 21-27 did not contain any relevant information. Click on the page numbers to view the page. 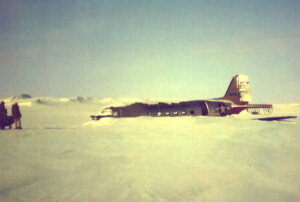 This photo, taken shortly after the crash, show the aircraft in its original nose-down position. It is taken from the official accident report. Click on the photo for a larger image. There are many interesting details to be found in this report. 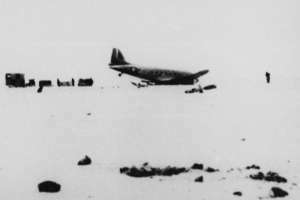 In short, the C-47 had been parked at the airstrip all night, during which time quite a bit of ice had accumulated on the wings. But the captain didn't think it necessary to de-ice the wings, and only the windshield was wiped with alcohol. To make matters worse, the aircraft was overloaded, there was a slight crosswind, and the airstrip was covered with five inches of snow. These factors resulted in a very poor take-off performance, and the aircraft simply failed to get airborne properly. It did get airborne twice, but did not gain enough height. 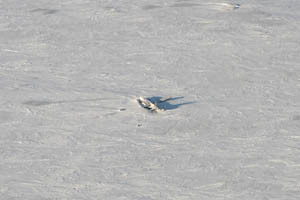 The skis and wheels hit a shallow river bank and buckled, and the right wing dipped and hit the ground (the damage caused by this is apparent in Merlin's photo). The aircraft came down on the remains of its skis and skidded across the snow-covered plain for a considerable distance before coming to a stop. All passengers and crew managed to escape quickly, and nobody was seriously injured. The damage to the aircraft was significant: both props and both oil coolers torn off the engines, left and right main landing gear forced back up through the engine nacelles and both landing gear strut braces pushed upwards through the wings, right ski torn in half, left ski severely damaged, left side of the fuselage torn open by the left propeller just aft of pilot's seat, both left and right engine mounts broken in several places, right wing damaged, right engine #12 cylinder head broken off and thrown through the side of the fuselage, etc. Add to this the fact that there were several thousands of surplus C-47 aircraft available at that time, all left over from the Second World War, and it is clear why the USAF immediately considered this aircraft a total write-off and did not attempt any repairs. Another photo from the original report. This photo shows the positions of the props, which were ripped off the engines. Click on the photo for a larger image. 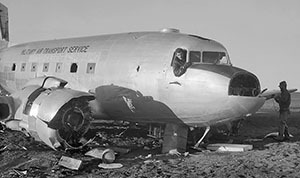 After having seen the passenger list in the accident report, Don Shanks managed to locate one of the passengers of the crashed aircraft and spoke with him. This person confirmed the details in the report, and in fact remembered the civilian passengers suggesting that the wing edges be also wiped. But they were ignored by the pilot, whom he described as a very officious officer. He also told that crew and passengers were evacuated from the weather station the following day, by a USAF C-54 aircraft. The conclusions and recommendations in the official report do indeed lay much of the blame with the pilot, Major Creo. However, in his defence it must also be said that the recommendations made in the report point to a general inexperience with arctic operations, not just by the pilot, but by the USAF as a whole. Valuable lessons on arctic aircraft operations have undoubtedly been learned from this crash. The official report shows that the earlier news article from the Canadian military does contain some errors. The aircraft is not and never has been submerged in shallow waters, and it did not skid across the frozen bay for 3,000 feet. In fact the aircraft never came near the bay, but ended up on muddy land past the end of the airstrip. Also the undercarriage and skis were not ripped off, and although the skis were retracted, the wheels were not. The engines were not ripped off either, but only the props were. 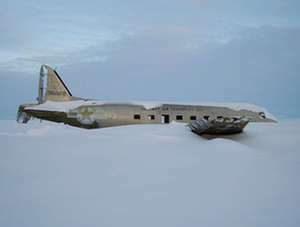 The C-47 looks very small in this barren, frozen and desolate landscape of snow and ice... 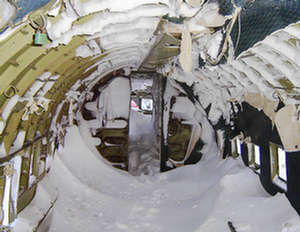 This photo, taken on 6 April 2004, clearly shows the conditions that managed to keep it in fairly good condition for almost 55 years. Photo by Nathan Vanderklippe. Click on the photo for a larger image. 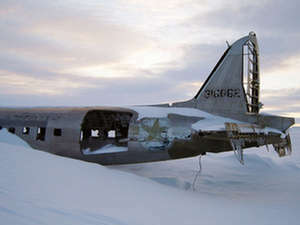 Now, almost 57 years after the accident, the C-47 still lies on the barren and muddy shoreline of Station Bay near the now unmanned Isachsen weather station on Ellef Ringnes Island in Canada. And even though it has been lying there for so long, the aircraft did not deteriorate all that much. Of course the crash itself and 57 years of severe weather have left their marks: the paint has faded considerably (the red paint on the tail in particular), the fabric of the control surfaces is completely gone, and most windows and doors have been removed or smashed in. But apart from all this, the aircraft is still basically complete and in one piece. The remote location has effectively kept the ever-present vandals away. The aircraft has been positively identified as Douglas C-47A Skytrain 43-16062, manufacturer serial number 20528. It was delivered to the USAAF on 14 June 1944, and flew with the Troop Carrier Command during the war years. It was serving with the Military Air Transport Service (MATS) when it crashed, and at that time it was only a bit more than five years old and had clocked a mere 3,353 flying hours. The C-47 today, in early April 2006. Photo by WO Ed Patten, First Canadian Ranger Patrol Group. Click on the map for a larger image. 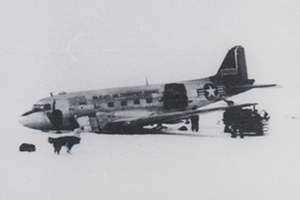 Unfortunately no further info on its history could be found, except that on 26 December 1947 it was used to successfully evacuate the crew of USAAF B-17G 44-83790, which had crashlanded on frozen Dyke Lake in a remote part of west Labrador two days earlier. For this dangerous mission, which made quite a few newspaper headlines at the time, the C-47 was first flown to Goose Bay to be equipped with skies and JATO bottles (Jet-Assisted Take-Off). It is very well possible that this mission was the start of this aircraft's arctic, ski-equipped career. Interesting detail: in August 2004 the crashed B-17 was salvaged from the lake, and it is currently being restored at a small airport near Douglas in Georgia, USA. Perhaps, even though a C-47 is not nearly as rare as a B-17, the same can be done with the Isachsen C-47... It is certainly in a much better condition than the B-17 was! Note that this airframe was built as a C-47A, but the official USAF report clearly identifies it consistently as a C-47D, on many pages. This must be a mistake, because a C-47D is a C-47B with its superchargers removed. A C-47A cannot be converted into a C-47D, because it does not have any superchargers to begin with. As far as I can see, this must be an error in the official USAF accident report. The black arrow marks the very remote location of Ellef Ringnes Island, Nunavut, Canada. Click on the map for a larger image. Ellef Ringnes Island is a very remote arctic island in the far northern regions of Canada. It's one of the Sverdrup Islands, which belong to the territory of Nunavut. This territory was part of the Northwest Territories until April 1, 1999, which is why all documents relating to the crash mention the Northwest Territories, and not Nunavut. For the wreck-chasers who like a remote challenge: The old Isachsen airstrip is at coordinates 78°47' N and 103°22'W, about 2 km east of the Isachsen weather station, adjacent to the eastern shoreline of Station Bay (part of Deer Bay). Don't confuse this old airstrip with the new one that was constructed in 1954 at the opposite side of the weather station! The wreck itself is located about 1 km past the southeast end of the strip. Happy hunting! In late July, through the valued help of Andreas Morgner, I received some excellent photos of the wreck, taken in early April 2006 by a Canadian Ranger Patrol Group. The photos are a valuable addition to this page, because they give a detailed view of the aircraft's left side and its interior, both of which are not visible in the other photos. Excellent photo of the aircraft's left side, clearly showing the damage done by the runaway prop. Photo by WO Ed Patten, First Canadian Ranger Patrol Group. Click on the photo for a larger image. Another shot of the left side. Not much is left of the control surfaces... Photo by WO Ed Patten, First Canadian Ranger Patrol Group. Click on the photo for a larger image. 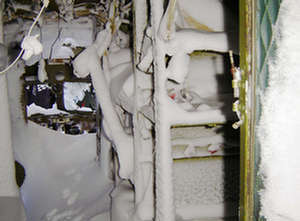 And this is what the severe arctic weather does to the aircraft's interior every winter. Photo by WO Ed Patten, First Canadian Ranger Patrol Group. Click on the photo for a larger image. Photo taken in April 2006, can you imagine what this looks like in December or January? Photo by WO Ed Patten, First Canadian Ranger Patrol Group. Click on the photo for a larger image. The wreck of 43-16062 was briefly shown in an episode of the BBC programme "Top Gear", first aired on 25 July 2007. Information from several other sources revealed that the shown C-47 footage was filmed on 02 May 2007. Not surprisingly, the footage showed that the condition of the wreck had not changed much since 2006. In 2006 it only had a few bullet holes in the USAF star insignia on the left side, but the Top Gear-footage also showed several in the insignia on the right side, which must have been added during the past year. Slow vandalism continues, unfortunately. From the text and the photos on this page it is clear that I owe many thanks to many people. First and foremost to Isachsen weather station veteran Don Shanks, whose help was invaluable, particularly during the difficult early stages of the research. To Isachsen weather station veterans Jay Gatlin and Merlin Mac Aulay for their help and for allowing me to use their photos. To Nathan Vanderklippe, for allowing me to use his wonderful aerial photo. To WO Ed Patten, First Canadian Ranger Patrol Group, for the use of his excellent interior and exterior shots. And last but not least to Andreas Morgner, through whom I obtained the recent photos from 2006, as well as the permission to publish them on this webpage.